One of John Lee Hancock’s earliest film credits is his screenplay for A Perfect World, a thoughtful drama that’s both one of Clint Eastwood’s more underrated directorial efforts and a showcase for one of Kevin Costner’s best performances. Hancock only made one more movie with Eastwood (1997’s Midnight In the Garden Of Good And Evil), but there are shades of Clint in his later career as a director, in how he’s chronicled diverse bits of Americana (The Alamo; Saving Mr. Banks) and occasionally uncovered some moral ambivalence in doing so (as in The Founder, about the formation of the McDonald’s fast food chain). 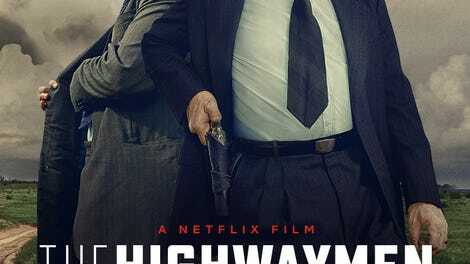 Given all that, The Highwaymen should be right in Hancock’s wheelhouse of what might affectionately be termed Dad Movies. Examining the saga of Depression-era bank robbers Bonnie and Clyde from the more upright side of the law, it’s the kind of men-wore-hats period piece Eastwood has frequently made in the final stretch of his career. The movie even reunites Hancock with Costner, who in his 60s has pursued roles that allow him a certain grandfatherly moral authority. He certainly finds one in Frank Hamer, a former Texas Ranger reluctantly called out of retirement by Governor Ferguson (Kathy Bates, in basically two scenes), who is frustrated with the celebrity of robbing, murdering Bonnie Parker and Clyde Darrow—and their success at eluding the authorities. Though the movie is upfront about the fact that Hamer and his more reticent partner Maney Gault (Woody Harrelson) are past their prime—they’re easily winded, their shooting is less than straight, and Gault has to take frequent urination breaks—those are some of the only concessions made in the face of their otherwise stolid authority. Because their detective work (at least as depicted here) has a plodding, workmanlike quality, the dominant narrative of the film eventually becomes Frank trailing Bonnie and Clyde and giving a series of stern lectures in their wake, aimed at anyone who shows these outlaws sympathy or, worse, hero worship. A state policeman (Thomas Mann) who happened to grow up with them and sees them as troubled kids? Lecture him! Clyde’s father (William Sadler), who doesn’t despise his murdering son? Lecture him! The throngs of admirers? No time to lecture them all, but be sure scowl in their general direction. 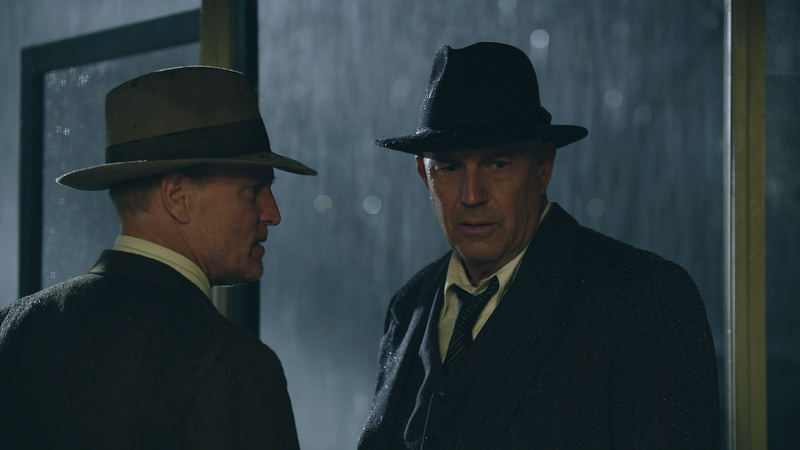 Costner’s dutiful scowling alongside a more down-to-earth Harrelson, especially during scenes set in Frank’s car, might bring to mind the ornery pontificating of True Detective, if it featured Baby Boomers role-playing as Greatest Generation do-gooders. (The real Hamer and Gault were born several generations earlier, of course, but their movie versions’ stoic can-do ethos matches up.) Then again, the average episode of True Detective is shot more dynamically than this Netflix potboiler, which resembles a big-screen production, but just barely. At his best, someone like Eastwood can make this kind of sparseness—of scenery, of characters, of action—look elegant. Hancock makes the Texas scenery look more like staring out a dusty car window on the fifth hour of a long drive. One of his more stylish flourishes involves obscuring both Bonnie (Emily Brobst) and Clyde (Edward Bossert). They’re both played by stunt performers, and though there are brief scenes of the carnage they inflict, their faces are hidden for most of the first half of the movie, and glimpsed only briefly after that. It gives them a ghostly aura, probably intended to comment on their status as myths in the making, while avoiding direct comparisons to the famous 1967 film starring Warren Beatty and Faye Dunaway. The technique also matches right up with Frank Hamer’s view of the pair as faceless quarry. There’s nothing wrong with assuming Hamer’s point of view. Bonnie and Clyde were killers, and the cult that developed around them is certainly disturbing. But Hancock doesn’t have much to say about either the criminals or the sorta-cops who start to close in on them. Costner and Harrelson, the kind of actors who feel like they’ve worked together before even though they haven’t, barely have room to develop a rapport. When they needle and wheedle each other, their irascibility gives The Highwaymen a pulse. The rest of the time, it’s a bit of a straight-shooting bore—a movie that decides the best corrective to the misguided hero-worship of outlaws is getting all starry-eyed over the very idea of Texas Rangers. After noble and varied entries like Jack Reacher, Hell Or High Water, and The Old Man & The Gun, The Highwaymen is a crucial reminder that good Dad Movies aren’t as easy to make as they look.